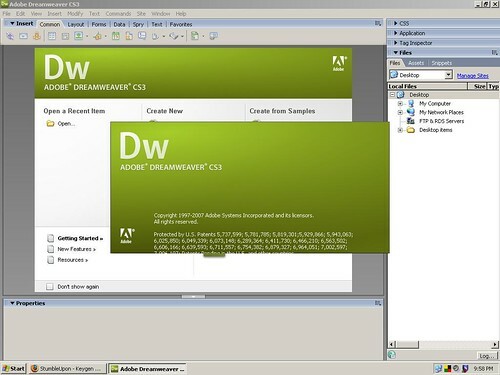 With Cs3 Adobe integrates its Spry AJAX Framework into dreamweaver. Its light and does not depend on server side scripting. Spry widgets are prebuilt, common user interface components that you can customize using CSS, and then add to your web pages. With Dreamweaver, you can add a number of Spry widgets to your pages, including XML-driven lists and tables, accordions, tabbed interfaces, and form elements with validation. See Adding Spry widgets. Spry effects are a simple, elegant way of enhancing the look and feel of your website. You can apply them to almost any element on an HTML page. You can add Spry effects to enlarge, shrink, fade, and highlight elements; visually alter a page element for a certain period of time; and more. See Adding Spry effects. Dreamweaver includes enhanced integration with Photoshop CS3. Now, designers can simply select any portion of a design in Photoshop—even across multiple layers—and paste it directly into a Dreamweaver page. Dreamweaver presents a dialog box where you can specify optimization options for the image. Should you ever need to edit the image, simply double-click the image to open the original layered PSD file in Photoshop for editing. See Working with Photoshop. The new Browser Compatibility Check feature in Dreamweaver generates reports that identify CSS-related rendering issues in a variety of browsers. In code view, issues are flagged with green underlining, so you know exactly where the problem is. After you identify the problem, you can quickly fix it if you know the solution, or, if you need more information, you can visit Adobe CSS Advisor. See Check for cross-browser CSS rendering issues. The Adobe CSS Advisor website contains information on the latest CSS issues, and is accessible directly from the Dreamweaver user interface during the Browser Compatibility Check process. More than a forum, a wiki page, or a discussion group, CSS Advisor makes it easy for you to comment with suggestions and improvements to existing content, or to add new issues for the benefit of the entire community. See Check for cross-browser CSS rendering issues. Dreamweaver offers a set of predesigned CSS layouts that get your page up and running quickly and help you learn about CSS page layout by providing extensive inline comments in the code. Most site designs on the web can be categorized as one-, two-, or three-column layouts, each with a number of additional elements (such as headers and footers). Dreamweaver now offers a comprehensive list of essential layout designs that you can customize to fit your needs. See Create a page with a CSS layout. The Manage CSS feature makes it easier for you to move CSS rules from document to document, from the head of a document to an external sheet, between external CSS files, and more. You can also convert inline CSS to CSS rules, and place them where you need them—just by dragging and dropping. See Move CSS rules and Convert inline CSS to a CSS rule. Integrated with Dreamweaver as well as throughout the family of Creative Suite 3 software, Adobe Device Central simplifies the creation of mobile content by giving you the ability to quickly access essential technical specifications for each device, and shrink the text and images of your HTML page to show accurate rendering as it would appear on the device. See Previewing pages in mobile devices.